This Complete Shower Niche Guide thoroughly explores the question What is a Shower Niche, by providing you with all the resources you might need for your important shower niche decisions (the different types, installation issues and where to buy them). This is Steve from SKG Renovations (Steve’s bio). This actionable shower niche info comes from my experience installing all kinds of shower niches during my bathroom and shower remodelling career. Answering the question: What is a Shower Niche? 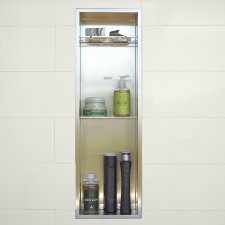 A shower niche is a fairly common term used to describe a storage space in the wall of your shower or bath to store soap, shampoo bottles, etc. It is a permanent recessed shelf (or niche) in the tile wall that is finished and waterproof, that allows you to use the space inside the wall as extra storage. Other familiar and interchangeable terms for “shower niche” include bathroom niche, shower shampoo niche, built in shower shelf, shower recess, shower nook or shower cubby, to name a few. To fully answer the question, What is a shower niche?, we must also define the two main types: tiled shower niche and finished shower niche. Each of these two niche types also have some variations. There are two main types of Shower Niches: Tiled and Finished. 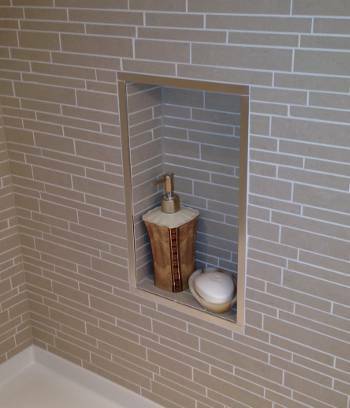 i) Custom tiled niches require the construction of a framed box between the wall studs. They are then covered with tile backer board, waterproofed, then tiled. This type is the most costly, time consuming and error prone of all the niche types but can be built to any custom size. ii) The prefab or preformed shower niche is the easiest tiling niche to install and waterproof. It can be made of plastic, foam board or stainless steel and it’s surface is designed to tiled upon (has a tile bonding surface). They are available in only a few standard sizes. i) The membrane bonding niche has an outer flange for bonding to waterproofing membranes and attachment to the framing. They can be made from stainless steel or porcelain. These are much easier to install than a tiled shower niche. ii) The retrofit niche mounts into a hole in the finished tile & fastens to the tile surface with adhesive. They can be made from stainless steel, porcelain or plastic. This type is the easiest to install but DOES NOT bond with the waterproofing membrane. There are so many variations within the two broad categories of shower niches (Tiled vs Finished) that it really helps to weigh the pros and cons of each of the shower niche designs. The Custom Built Tiled Shower Niche can be built to almost any size, cater to any design scheme, and can be made waterproof. Vertical niche can increase storage with less cost than horizontal niche. Cons: Risk of water leaks if built poorly. Both are more costly than other niche types – the horizontal niche, excessively so. A custom built tiled horizontal shower niche is a bold statement of luxury with a larger storage capacity than other niche designs. Cons: Cost and time required for niche construction and necessary structural changes is greater than all other types. The tile redi prefabricated /preformed shower niche products are easy to install and already waterproof (sealed foam board construction). Cons: Some say they are easily damaged during handling and only available in limited sizes. This style of shower niche is completely finished so there is no need for tiling, which means easier / cheaper installation, waterproof design, easy cleaning and membrane bonding. Cons: Some say the look is too bold (stainless steel types) or too dated (ceramic types). This type of shower niche also has a finished surface so there is no tiling or finishing required however, they are mounted into a hole in the shower wall AFTER the tiling is complete. Cons: It does not integrate with the waterproofing membrane, increasing the risk of leaks. Once you have figured out your preferred shower niche design, then you need to figure out how large, where and how high you want your new niche. How large you want your shower niche is related to your preferred niche design, but you must also consider it separately to determine your practical needs. Do you want a large shower niche with plenty of storage for a large family, or is aesthetics more of a priority for you? Where should your niche be positioned? Do you want quick access to products while standing in the water stream, then a valve wall placement, or middle of the back wall might be appropriate. Are you concerned about water constantly spraying in the niche and water logging all products? Then placing your shower niche a little further from the valve wall might be prudent. And what about height? Are you vertically challenged or perhaps you have kids that will be using the shower regularly. You must pick a height that suites all your needs. No matter which shower niche you decide to install or where you install it, there are some important guidelines that must be followed to avoid making a few very regrettable mistakes. Many old-school contractors still do not routinely install shower wall waterproofing membranes. As such, leaks at the shower wall corners and the wall to base corner are common with no membrane. Fitting a retrofit niche into a hole in the shower wall and gluing it to the tile by a tiny silicon bead is always a bad idea. The inevitable result is water in the stud wall leading to mold…… you get the idea. Most finished shower niche products do not have built in flange for attaching to the waterproofing membrane. Whether you buy finished niche or a prefab tile ready niche, you must make sure it is bonded to the membrane. Construction of a custom horizontal tiled niche involves removal of a section of the wall studs that support your shower wall. If this procedure is not done correctly by someone qualified, it can seriously compromise the structural integrity of the shower wall. It is generally not recommended to mount a shower niche in an outside wall, especially in older homes. You can probably get away with it in a milder climate if the stud wall thickness is 6″ or more but you should check with a local building professional. Perhaps you’re contemplating which of the many shower storage options will work best for your existing shower, OR you’re ready to remodel your shower and install permanent recessed storage. A popular and cost effective temporary shower storage option is the classic shower caddy. These can take the form of racks suspended between you shower floor and ceiling or be hung from the shower head or shower door. Caddies can be very effective for many years, but can also fall apart and some can cause damage to your shower floor or ceiling. Other more permanent but slightly more obtrusive shower storage are the wall mounted soap shelves and shower racks. These come in a infinite array of styles and sizes in stainless steel, coated steel, wood and plastic varieties. And slightly more obtrusive again are the floor racks and baskets. These storage options can be more useful because of their larger size and multiple shelves. The downside is that they tend to take up valuable floor space and tend to get kicked and tripped over. The only permanent shower storage option is the shower niche, which requires a full remodel of your shower. A shower niche is fully recessed into the shower wall so it, and all your shower items, stay out of your way during showering. A very clear downside is the excessive cost compared to the other shower storage options available. For those of you still contemplating the various shower niche options, or those of you that have already decided, here’s a shower niche buyers guide with a few examples of each of the three types of shower niches. It’ll hopefully help you further qualify the niche options based on their actual cost (material and installation). 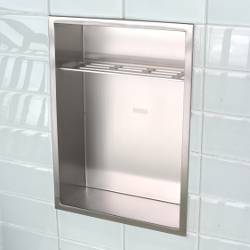 This is one of the most popular, most trusted, most expensive, foam board, tile ready shower niches available. This is another popular prefab tile ready shower niche. It’s made of plastic rather than foam, and has a larger selection of sizes than Schluter. Note: Both of these niche types are finished so there’s no tiling involved. You can assume around $50-$100 install labor cost (both types). Note: This niche type attaches (bonds) to the shower wall waterproofing membrane. Finished SS surface, built in tile border trim, perforated shelf, quick install, membrane bonding. Glazed ceramic finish, tile border trim, shelf, quick install, membrane bonding (mounting flange). Note: This niche type DOES NOT bond to the shower wall waterproofing membrane. Polished SS finish, no shelf, quick install, NO membrane bonding (overlap flange). Glazed ceramic finish, ribbed shelf, quick install, NO membrane bonding (overlap flange). White acrylic finish, 2 shelves, quick install, NO membrane bonding (overlap flange). SKG Renovations (my company) charges a minimum shower niche cost of $600 (materials and labour, including tiling) to build a custom framed, tiled shower niche, 10″ x 12″ with one glass shelf. Taller niches would increase in cost incrementally. If you would like more detailed information on all the shower niches above as well as my reviews of each, you can check out my Shower Niche Buying Guide. I hope you were able to get some useful advice from my What is a Shower Niche post (and the linked content) to help you during your shower remodel project. If you’d like to write a comment about the array of Shower Niche topics I’ve covered in this post or what topics I may have missed, please let me know in the comments below.